Q: Does this Apple Watch Case fit for Apple Watch Series 2 ? A: Yes. Compatible with all 38mm Apple Watch: Apple Watch Series 2 & Series 1 & Series 3 & Nike+ & Edition & Hermes. Q: Does this protective iwatch Case come with a Apple Watch Band together ? A: No. Case only, not including the band or screen protector or other parts. Special Design: design for apple watch 38mm/42mm series 1 series 2 and series 3, made of high quality plated TPU, your watch will looks more shining and durable with this case. 99% high transparency, still responsive and clear. Strong Function: this case covers the apple watch screen and curved edges, offer full protection for your iwatch to against scratches, drop and bump. Warm Notice: wearing the full screen protector at gym or sports activities will cause moisture under the screen protector, we recommend taking it off before showering or fitness exercise. 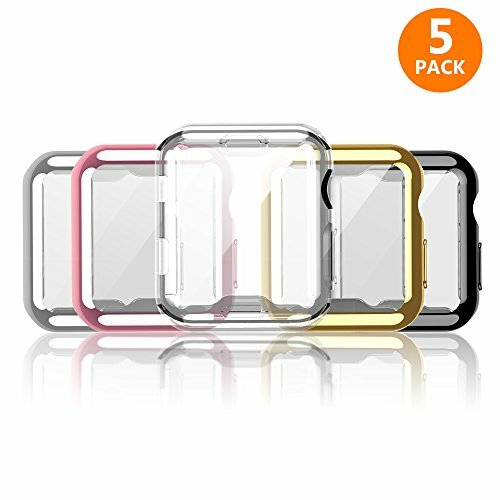 Package Include: 5 pack of the case for 38mm apple watch.